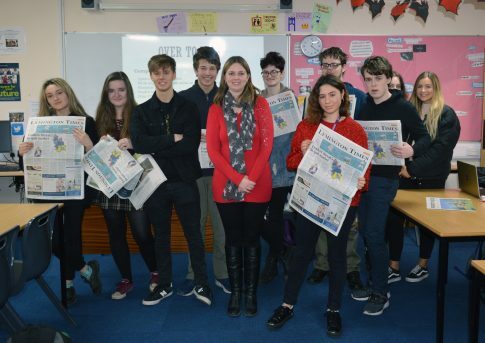 Second year A Level Creative Writing students took part in a journalism workshop run by local newspaper the New Milton Advertiser and Lymington Times (A&T) at the College recently. A&T reporter and former teacher Charlotte Baker led the unique learning opportunity, which explored the modern media environment, techniques used by journalists and how to write an engaging story. Charlotte was quoted in the A&T last Friday, saying: “Local news is something that affects everyone and it is vital that we engage young people with issues in their local area. Meanwhile, Brock English teacher Ellen Rawson said in the same article: “The workshop enabled students to catch a glimpse of the real-life world of local news reporting as they worked with Charlotte to determine the best methods of discovering and approaching local news and learned how to write headlines. “The workshop was both eye-opening and valuable, not only to the students hoping to pursue careers in journalism but to all who attended,” she added.